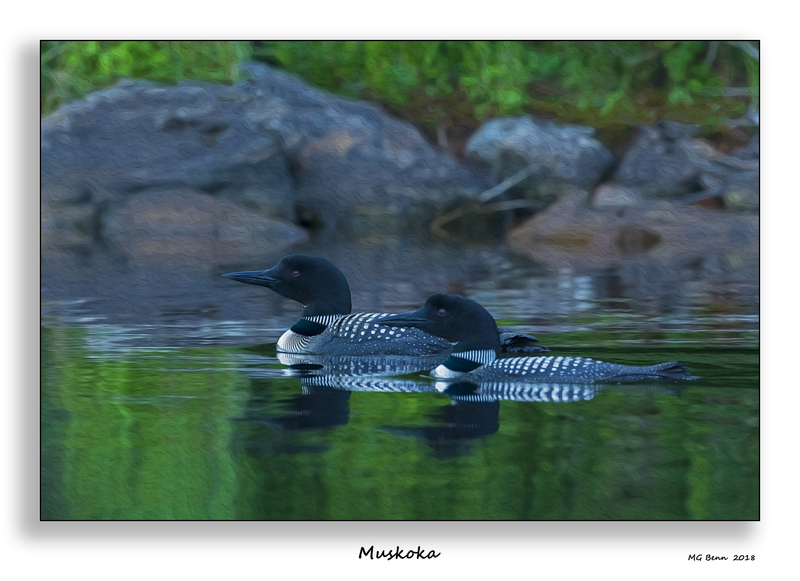 Taken in the Muskoka region of Ontario Canada shortly after dawn. When I took this image I thought it might look good using the Oil Painting Filter in PS. It's a fairly subtle effect but I quite like it. I think "subtle" is very appropriate for the subject- just enough texture to make it a bit different. A beautiful pair- I wish they were just a tad brighter in the scene-it is really quite charming. I like that you left the loons largely untouched, and applied the filter predominately to their surroundings. It’s a lovely, well-composed image! And it’s very well done! Subtle works well with this lovely pair, and like Cindy, I would like to see them just a touch lighter against the background. Thanks Cynthia, re the birds being a bit on the darker side, it was to keep all aspects of the image in keeping with the oil painting effect but I agree had I processed this as a traditional photo then I would have brightened them up a bit. That being said I'll go back and have another look at the image. Thanks for the comment. Thanks Ron, you have a sharp eye to notice that.